Sometimes, when players are first promoted, their teams try to ease them in. After all, there’s already plenty of pressure, and you don’t want to give someone the shakes. Might as well give a guy the opportunity to get comfortable. Other times, whether by design or necessity, there’s no such special treatment. A few weeks ago, Eric Lauer became the 27th starting pitcher to make his big-league debut in Coors Field. You might remember Lauer for half-smiling after allowing a grand slam. Lauer was charged with seven runs in three frames, which is not good, but the history of these debuts is predictably not good — starters have allowed 6.9 runs per nine innings. Coors Field is a beast. Nothing in the minors can prepare you for major-league bats in Colorado. As a rule of thumb, starting pitchers generally aren’t happy to see their managers. Starters, as a breed, want to pitch until their arms fall off. But Peralta left beaming after 98 pitches, because he left with a 7-0 lead. He’d only just allowed his first hit of the game, and out of the 21 Rockies batters he’d faced, 13 of them had struck out. Peralta became just the fifth pitcher in recorded history to pick up at least 13 strikeouts in his debut. 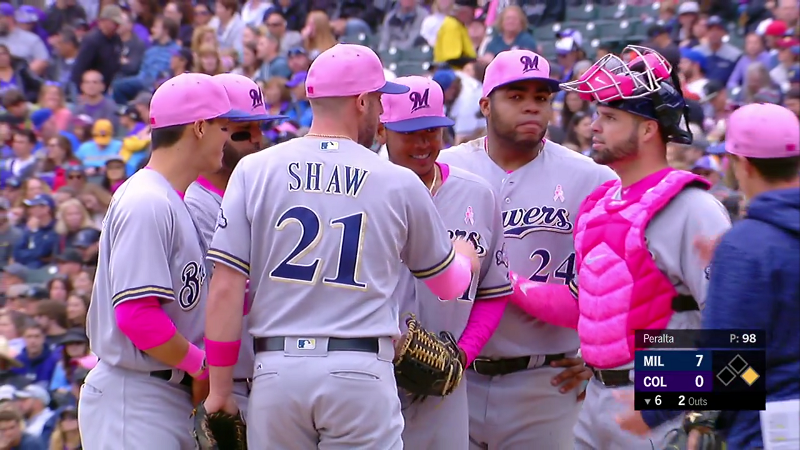 Peralta was no stranger to strikeouts in the minors, but nothing he’d done could compare to this, shutting down a lineup of big-leaguers in the league’s most hitter-friendly ballpark. And of Peralta’s 98 pitches, 90 were fastballs, which averaged about 92 miles per hour. Peralta dominated the Rockies, in Colorado. He dominated them in his first game in the majors. And he dominated them with one pitch. The fastball generated 18 whiffs alone. There are whiffs off the plate, and there are whiffs up. But you also see that assortment middle-middle. That tells you two things. One, Peralta doesn’t have pinpoint command. No one wants to pitch middle-middle. But two, he was fooling hitters anyway. 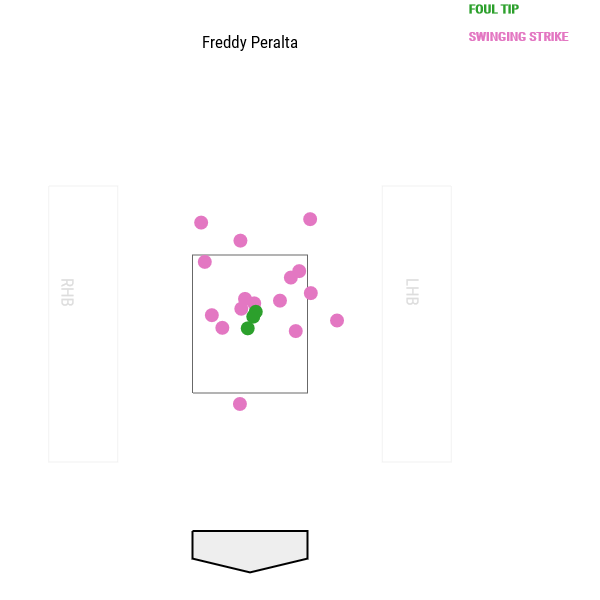 Freddy Peralta, pitching in Coors Field, was getting away with middle-middle low-90s fastballs. He has his delivery to thank. They didn’t see the ball. I think that’s exactly right. We don’t write all that much about deception, because we don’t have particularly useful measures of deception, but some pitchers have more of it, and some pitchers have less. Peralta has a sneaky fastball, which is what allowed him to succeed over the middle of the plate. That Nolan Arenado swing posted above — that’s not the swing of someone who’s seeing the ball clearly. Peralta was doing something tricky, and it’s all just part of his motion. Peralta generates seven feet of extension, which is up in Tim Lincecum territory, and does so with a cross-body delivery that begins on the third-base side of the rubber. He also has a low arm slot and loose, whippy arm action that further adds to hitters’ confusion. The ball is behind his head. Then the ball is behind his elbow. Then the ball is shown to the hitter, just as it’s about to come out. This is what Eric was referring to with the whippy arm action. The hitter loses sight of the ball, and then, all of a sudden, the ball explodes on the plate. 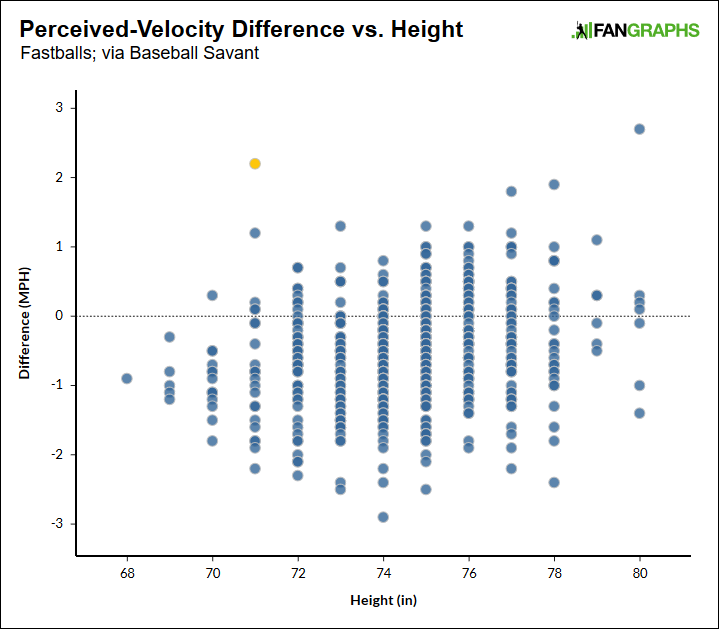 An unusual delivery delivers a fastball with unusual movement, and it’s not just the Rockies who couldn’t figure the fastball out. The fastball is why Peralta has been a strikeout machine in the minors. It’s not that Peralta is obviously a finished product. He could stand to add some refinement, polishing a second or third pitch. It’s not that Peralta is definitely the best starting pitcher right now in the Brewers’ rotation. He needs to make more starts, and he needs to repeat some opponents. But I don’t think the Brewers were planning on Peralta being much of a factor in the 2018 season at all. Peralta has forced his way into the conversation, on the basis of one start alone. Pitchers will tell you when they’re ready for a greater challenge. Peralta looks ready before the Brewers expected, in large part because hitters can’t easily see his pitches. Turns out that’s a useful trait to possess. We hoped you liked reading Meet the Extraordinary Freddy Peralta by Jeff Sullivan! A question that comes to mind is: does this delivery put more stress on his elbow than that of other pitching deliveries? If anything I would think that it would be better for the elbow as there is probably way more drag on the arm from a lower slot.